In support of the most recent exhibition at the Portland Art Museum, Rodin: The Human Experience, Rodin Remix was a hands-on space where visitors could create figures based on Rodin’s process of reusing previously-made sculpted arms, legs, and heads, into new works. It put a modern spin on Rodin’s method of mass production by showcasing 3D printed versions of Rodin’s sculptures. I came into the Portland Art Museum in October, relatively new to interpretation. My guidelines for the Rodin project were to create an in-gallery multi-sensory experience for all ages that would communicate 3D elements of Rodin’s process. After researching Rodin, his assemblages struck me – it was creative and clever to reuse cast offs, fragments of plaster casts that had already been made, by recombining them into new sculptures. I wanted to visitors to experience for themselves Rodin’s reuse of plaster casts, but we needed a 3D reusable material that could go in the gallery, not plaster. At first I thought of paper dolls, since they were easily reusable, simple to produce, and people might know how to put paper dolls together. But then at a brainstorming meeting, 3D printing came up – we could produce 3D plastic parts of Rodin’s sculptures with connections for constructing and deconstructing. We partnered with the Portland 3D Printing Lab, a local Meet-Up group of enthusiasts, to produce 3D prints of Rodins. They were so enthusiastic, and figured out that magnets were the key to make the pieces of 3D printed sculpture easily stick together and break apart. The prints were made from free online STL files under the Creative Commons license, and, later, from scans of the Rodins in the show. We decided to scan some of the Rodins in the show because not every Rodin can be found in STL-file form online. The scanning process was surprisingly simple, and to show the public how it worked, it was filmed in a Facebook Live, the Museum’s first. The files that were used to print can now be found on the exhibition page of the Portland Art Museum’s exhibition website. from left to right: Auguste Rodin, La Defense, model made in 1879, cast ca. 1910; 3D scan of La Defense on Thingiverse; 3D Print of La Defense. 3D printing fit with other elements of Rodin’s process as well. Rodin would sculpt a model in clay, then pass it to his assistants. They rendered the work again in marble or bronze, sizing it up or down according to Rodin’s and his patron’s wishes. A 3D scan of an object can be similarly re-sized, to make a print of the desired height. Rodin’s assistants made hundreds of casts of the same model, all official Rodins, in a sort of artistic mass-production. Smaller bronzes, produced in large quantities, were more affordable. These relatively inexpensive bronzes widened the range of people who could purchase a Rodin, earning the sculptor more money and popularity. Just as Rodin mass-produced bronze casts of the same sculpture in multiple sizes and media, the Portland 3D Printing Lab made many 3D prints of Rodin sculptures, experimenting with size and color. Visitors were also encouraged to Instagram a photo of their creation in front of a backdrop of Rodin’s studio, which showed the plaster fragments he used. Each Monday during the run of the show I reposted a visitor’s photograph to the @portlandartmuseum Instagram, with the tag #rodinremix. Over 125 people Instagrammed their Rodin Remixes, and the comments we received on our reposts were reflective and positive. My goal was to make a fun, exciting interpretive space that used 3D prints to communicate to visitors about two parts of Rodin’s process: his assemblages, and his mass-production and use of resizing sculptures. This is my first interpretive space, and my first evaluation, and I am not positive this project fully met all of my learning goals. Visitors, especially those with children, clearly enjoyed their time in Rodin Remix, laughing, talking, and playing – making the sculptures interact with each other. Docents used the 3D prints for tours for people who are blind or have low vision, and for ArtNow, PAM’s program for people living with dementia and their partners. The ability to touch Rodin’s forms, to understand 3D printing, and to Instagram were all appreciated. And, multiple members of the Portland 3D Printing Lab who had not been to the museum in years, if ever, came, because their work was displayed in the galleries. Visitors in the Rodin Remix gallery at the Portland Art Museum. Photo by Jon Richardson. A little over half of the 250 people that I observed participated in the hands-on part of the interpretive space, and 145 people stayed in the space for more than 2 minutes. These numbers are skewed somewhat by two school tours I observed, since both of those had a lot of participation. But my hope that the space would communicate Rodin’s process may not have always worked. When I asked a few visitors what they thought the purpose of the space was, on average, they felt it was to touch, play, and interact. That was part of it, but not the entirety. I did enjoy the couple who said, “He really churned them out” – they clearly understood the mass-production angle. I could have crafted more precise questions for my evaluation, and my evaluation should have been more survey-based than observatory. It is possible more people understood the learning goals than I thought, but I did not capture their responses well. Attempting to cover two elements of Rodin’s process (mass-production and assemblage) in the same space, using 3D printing to illustrate both, confused people. Similarly, placing the space just outside the exhibition, in a throughway, meant Rodin Remix was not clearly a part of the exhibition. Rodin Remix evolved over time as well, which was both a boon and a complication. We planned for it to be a prototype space that would change, but it also evolved because even simple 3D prints took fifteen to twenty hours to print, and with over 20 prints in the space, the hours added up. The ability to change allowed me to experiment and improve. But Rodin Remix also did not look finished until the last month of the exhibition. Shashi of the Portland 3D Printing Lab with his print of Rodin’s Head of Balzac along with the Rodin sculpture. Photo by Jon Richardson, Portland Art Museum. The most exciting part of this project was working with the Portland 3D Printing Lab. They were generous throughout, coming to the museum and bringing others, advertising through their own channels, and on the second to last Friday of the show, bringing a 3D printer to the museum and printing live, in the gallery, which drew a crowd all evening. The success of this partnership may allow for future 3D printing projects at the Portland Art Museum, as well as other evolving interpretive projects, which the education department continues to develop. JEANIE NOTO is the Kress Interpretive Fellow at the Portland Art Museum, where she produces interactives and descriptive information to support the permanent collection and visiting exhibitions. Before coming to Portland, she worked as the Academic Intern at the Norton Simon Museum, and got her M.A. in Art History from the Courtauld Institute of Art. From early childhood to higher ed to policy, SXSWedu aims to represent everything innovative happening in education. Museums are just starting to make a presence. I estimate that museum and library professional made up 1% of the 7,000 attendees. Given our small presence, it was interesting to note where we intersected with the national conversation about the future of education (personalized learning, equity and access) and where we differed (STEM v. STEAM). I sat down with three other museum educators during our time at SXSWedu: Juline Chevalier from Minneapolis Institute of Art; Claire Moore from The Metropolitan Museum of Art and Anne Kraybill from the Crystal Bridges Museum of American Art. We talked a bit about our first-time experiences, perceptions, and reflections on SXSWedu. This young conference is still evolving and could look very different in the next few years. As we noted in the podcast, we believe it’s important for the museum field to attend and present at conferences like SXSWedu in order move from the periphery of education to becoming integral to the conversation. Guest post by Suse Cairns, doctoral candidate in the PhD Fine Art program at the University of Newcastle, Australia, and blogger at http://museumgeek.wordpress.com. This post has been a long time coming. When Mike first contacted me about the possibility of doing a guest post for Art Museum Teaching many weeks ago, I was too busy to immediately do so. I thought it was just a lack of time and clear head space. But even after the deadline driven urgency of that time had passed, I still hesitated and put off writing. Why? I was writing amply on other things, so it was no longer time that was the problem, nor general inspiration. So what was it? What was preventing me from starting this project? It turns out that my problem was one of elasticity, or more accurately, a lack thereof. I was feeling stretched, and my avoidance of writing this post was a tactic to avoid the discomfort that brought. Let me explain. When I write for my own blog, I have a very definite comfort zone. I have defined the intellectual space, and I know intimately its boundaries. In fact, its boundaries are my boundaries. I can stretch or push them, I can expand them as far as I am comfortable, and still exist within a very safe space. I recognise the likely readers and know their vocabularies and topical touch points. I know intimately what’s been covered before and what people have responded to, because it has all been within my own domain. The community of readers is my community; the space is my environment. Even when I am exploring ideas that are at times uncomfortable and that push me to consider things that I have not previously, I still retain a certain level of control. But I don’t have the same sense of easy intimacy with the Art Museum Teaching website or audience. I know less who reads this site, and the sorts of topics and ideas they will respond to. I have not worked as a museum educator myself, and was uncertain what I could contribute that would be of interest to those who are. So even though I was undertaking an act that I do regularly (writing), I was on edge. Unnerved. Stretched. Such feelings, then, seem to resonate with two concepts that are at the very focus of the current investigations here on Art Museum Teaching. The first of those is of art museum education itself. When students come into a museum, or come into contact with art – sometimes for the first time – they may be out of their own comfort zones. That sensation can be in response to the physical space of the museum, where students might not know the rules or customs of the space; and it can be intellectual, when students have not encountered or don’t know about art and may not understand its language or how the art world is constructed. In many cases, students will feel both these sensations – out of place and uncertain of the context in which they find themselves. The second way this sense of being stretched beyond comfort resonates is in the professional space of the museum, when ideas like the Elastic Manifesto that push for experimentation require that the museum itself, and its staff, make themselves deliberately uncomfortable. 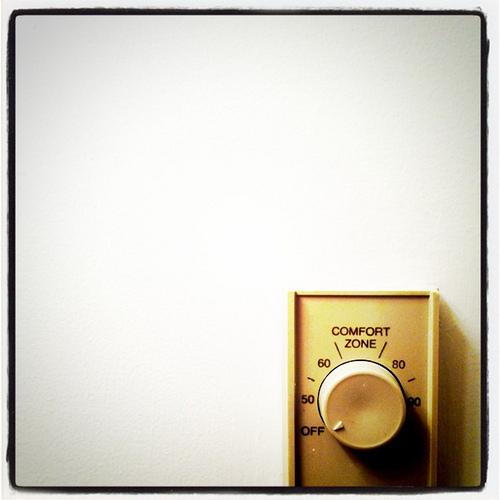 Innovation and learning both require a certain amount of discomfort. They need a step into unknown territory, which will often be accompanied by a reciprocal jolt of fear. For some people who crave the new and who yearn to explore new spaces, this will be a great sensation. Such natural adventurers will likely thrive from these conditions. But there are many who will find such sensations stressful and do what they can to avoid them. Henry Kissinger said that “The task of the leader is to get his people from where they are to where they have not been.” It is a useful angle for conceiving of the role of both art museum educators, and advocates for change and experimentation in the museum. Visitor interacting with Doris Salcedo’s “Shibboleth” at the Tate Modern. Photo by truu. Getting uncomfortable is important for growth, but mitigating that discomfort to keep it at an acceptable level is also useful. How can we provide scaffolding for that process, so that those who embark on the journey to somewhere new have the tools and permission to explore and accomplish, without fear that making an error will be cataclysmic? How can we make the museum space a safe environment for exploration and unknowning, both for students and staff? I’d argue that one step in this process is for those who advocate for change in others spend a little time getting uncomfortable themselves, to remember the mildly unpleasant sensations the process can evoke. Stretching yourself, reaching beyond your normal boundaries can remind you that even small moves into unfamiliar territory can be challenging. Even writing this post, beyond my own ‘normal’ space, has required that I extend and stretch myself to find a creative solution. It has been a thoroughly rewarding process, but was neither easy nor fast. It required getting uncomfortable, and living in that state for an extended period of time. Being aware of such things is useful. What do you think? How can we as museum professionals make sure that the museum is a safe space to get a little uncomfortable? How can we scaffold the process of experimentation, innovation, and learning, to draw out creativity and productivity, whilst mitigating the pain of the unknown?